After a long bus ride from Iguaçu Falls we arrived in Buenos Aires in the morning to some really cold weather. Instead of staying on we decided to head down further South to the town of Mar del Plata. Mar del Plata is a medium size sea-side town where many Argentineans spend their summer holidays – essentially the local equivalent of our Blackpool. As it turned out the season had not started yet so the town was a little quiet with some of the restaurants and hotels still closed while the ones that were open were actually quite busy. The weather has surprised us with the temperature dropping from 37C in Iguaçu down to about 10C in Mar del Plata. I guess this was due to some very strong southerly winds blowing right through from the Antarctica, reminding us how close to the South Pole this place really is. After 3 days of walking around, doing some running and drinking good wine and eating steaks in the evening we took a bus back to Buenos Aires. We arrived in Buenos Aires on a Friday afternoon and found out that all of the hotels that we we’re considering staying at were fully booked. After 4 hours of searching eventually we’ve managed to find a hotel for 3 nights. It first it looked like a place that may rent rooms by the hour, but it turned out to be OK, except for the moldy bathroom and the inclusive breakfast. 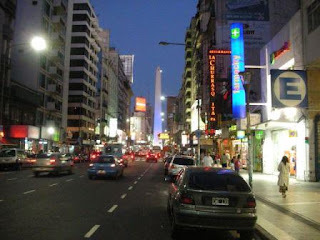 Buenos Aires is a big city and a very diverse one. Homeless people washing their clothing in the morning in the park fountains contrast against expensive hotels and restaurants. The city itself reminded me of Madrid, though many people like to compare it to Paris. Tango seems to be the traditional tourist attraction here and to comply with the touristy recommendations we’ve even attended a tango dinner show for 2 nights in a row. It was an interesting experience and the dancers are definitely expert (and some of them quite pretty too), but the experience is a bit touristy, although we saw quite a few local people the second time. The city is certainly busy, certainly during rush hour and at night when the many restaurants fill up. Most people eat quite late and the restaurants don’t get busy until about 11pm, especially at weekends, so we’ve been eating steak and drinking wine till the morning hours most nights – an interesting experience, even if not particularly conductive to weight loss. I found running to be a problem in Buenos Aires – most streets narrow and busy with people rushing around and parks outside the Palermo area are very few. On Sunday, however, the Palermo parks turn into running tracks with many people evidently trying to burn the excess calories gathered during the week from eating all the meat and all the wine drank. Last Sunday there was even a 10k race in Palermo, which I definitely would have been tempted to do if it wasn’t for the 20k that I already had run in the morning and the last of the 20 peso entry fee which I did not have on me. Altogether we spent 7 nights in Buenos Aires, but we needed a break from the big city life so we headed to Uruguay’s capital of Montevideo for 3 nights of luxury 4 star accommodation in the middle of our Buenos Aires visit. Montevideo turned out to be a very pleasant, easy going city. Surprisingly it seemed more European than Argentina and it was a nice break from the intensity of Buenos Aires. During our stay Uruguay played Brazil in the South America world cup qualification football game, which we watched in a local pub. It was great to experience the local atmosphere with the public divided into Brazil supporters and Uruguay supporters. Unfortunately for the locals after gaining an early lead Uruguay lost 1:2, which cooled the atmosphere a little. Overall a fantastic 10 days in Buenos Aires and Montevideo and finally we are starting to feel more relaxed and relieved of the stress and tiredness of the last few years of work and Ironman training. Hello to Buenos Aires - Tango, wine and steak? I am not sure that it is a good compination but it sounds like you do enjoy it. I am sure when you will be back you will not want to see another steak again!!!! Be careful with all these variations with the weather and temperature. Shall we expect some tango performances when you will be back?